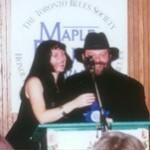 TBS exec director Barbara Isherwood (aka Vanna White) (L) and Producer and Songwriter of the Year, Colin Linden. 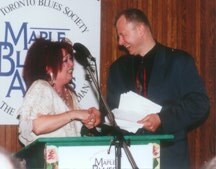 Female Vocalist of the Year Rita Chiarelli (L) shares a laugh at the podium with presenter Molly Johnson. 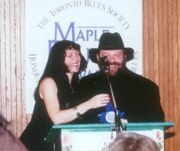 Mark Monahan, organizer of the Ottawa Blues Festival accepts this year’s Toronto Blues Society Blues Booster of the Year Award. 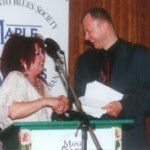 Drummer of the Year Maureen Brown (L) is congratulated by emcee John Northcott. 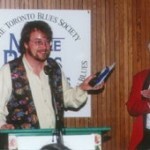 Multi MBA winner Colin James (L) accepts the Music Manufacturing Services Recording of the Year award. 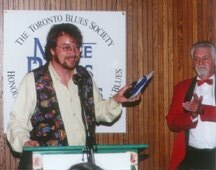 He is joined by Lindsay Gillespie of MMS, and presenter Murray McLauchlan.